Uveitis is an uncommon condition characterized by inflammation of the uvea, which is the middle portion of the eye. The anterior (front) portion of the uvea consists of the iris and the ciliary body; inflammation of this area is described as anterior uveitis or iritis (they are synonymous). If the inflammation extends to the ciliary body, it is then called iridocyclitis. Symptoms may include red eye, eye pain, being very uncomfortable looking at bright lights, a small pupil, or blurred vision. 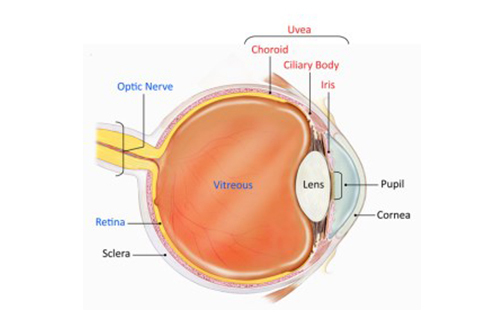 The posterior (back) portion of the uvea includes the choroid; inflammation of this area is called posterior uveitis. Patients may present with blurred vision or floaters (tiny, dark spots that move across one’s line of sight). There are multiple causes of uveitis. The main reason you are being seen by a rheumatologist is to be evaluated for a potential systemic autoimmune condition. Uveitis causes are categorized into different subsets: infection vs autoimmune conditions (systemic autoimmune condition or other immune-related conditions) vs syndromes isolated strictly to the eye. About 40% of patients may have uveitis related to an autoimmune condition. Interestingly, in about 30% of patients, there is no identifiable cause so we then classify it as idiopathic uveitis. There are numerous infectious causes of uveitis, among which include bacterial and spirochetal diseases (among which includes tuberculosis, syphilis), viral diseases (among which includes herpes virus, cytomegalovirus – CMV, West Nile virus), fungal infections, and parasitic infections (for instance, toxoplasmosis). We have to obtain blood samples to evaluate for exposures to these organisms. *Symptoms can occur suddenly, get worse quickly or develop gradually. They may affect one or both eyes. Uveitis can be associated with a variety of complications so it is imperative that patients understand the importance of closely being monitored. A slit-lamp examination and a dilated fundus examination are both required for the diagnosis of uveitis. There are treatment options for uveitis. The treatment certainly depends on the type and cause of the uveitis. Majority of the time treatment will include a form of steroid, which will help reduce the inflammation. Uveitis can be associated with a variety of complications so it is imperative that patients understand the importance of closely being monitored. It is important to closely follow up with both your rheumatologist and your ophthalmologist so we can prevent further progression of the disease and prevent occurrence of complications.